Set of two 11" high white candles. Each candle uses 2 AA batteries(not included). 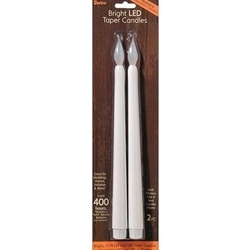 Candle is tapered at bottom and does not come attached to a base. Candle have a LED bulb with a 400 hour life.